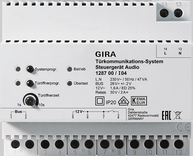 Control device to supply power to the audio components of the Gira door communication bus. Power supply of the reverse-polarity protected and short-circuit-proof 2-wire bus. Self-resetting electronic short-circuit and overload recognition of the operating voltage and the bus connection. Buttons for system and door opener programming. LED status indicators for operation, overload, system programming, and door opener programming. AC 12 V output to supply power to a common door opener. Permanent AC 12 V output to supply power to a DCS-TC gateway. Relay output for switching a door opener with its own power supply. Door opener time continuously adjustable from 1 to 10 seconds. The audio control device is intended to be installed in the sub-distribution. If this is not possible, use a common surface-mounted distributor. This component enables door communication systems with up to 70 devices to be established (e.g. 1 x built-in loudspeaker, 5 x add-on modules for built-in loudspeakers, 68 x surface-mounted home stations).